India is INDIA…No comparison & No compromise!!! It has been raining in Dallas for last 2-3 days. There was sudden fall in temperature and weather became very chilly. I am just praying that this rain and wind should stop as I already have some plan for weekend. I was chatting with one of my friends in Pune this morning. He told me atmosphere in Pune is cloudy and he was waiting for rains. After a while he jumped with excitement that rains are started and atmosphere has turned beautiful. I replied him that it was exactly opposite in my case. I am waiting for rains to stop. Suddenly, clouds of thoughts gathered in my mind. I became bit nostalgic thinking about rains in Pune, Ratnagiri, basically India. All those marathi songs from “Garawaa” and rest poems hit my mind. I asked myself why am I not enjoying rains here, are these rains different, but rains are rains, right…then what is so special about rains in my homeland and what is that which is missing here? Is it because I am not used to these rains and chilly climate? Or what is it? Or it’s just my perspective of looking differently at different things? I could not find the clue and got ready for the office. I made up my mind and came down the hotel with the thought to enjoy these rains. There were light showers and chilly. I tried to smell the fragrance of wet soil after the first rains (as in India) but couldn’t find any. There were no kids and no one playing or enjoying in the rain. The “feel-good” factor was actually missing. I was bit disappointed. I guess there lies the answer. I remember my Mama (who is settled abroad) once told me that “We cannot enjoy different seasons like India in London.” I have to agree with him. My sis is a doc and is in Govt. service (as Medical Officer). Every year these medical officers need a continuation order from government of India. Health department is now shifted to Pune from Mumbai. My sis has completed more than 11 years and still each year this continuation order drama continues. This time I accompanied her to the health department. We met the concerned person 2 months back and obviously he was no exception in this highly corrupt sector. I visited there in the next week and I was told that I should keep on reminding him about the order. Also I SHOULD NOT deny going there again and again as “I am based in Pune“. 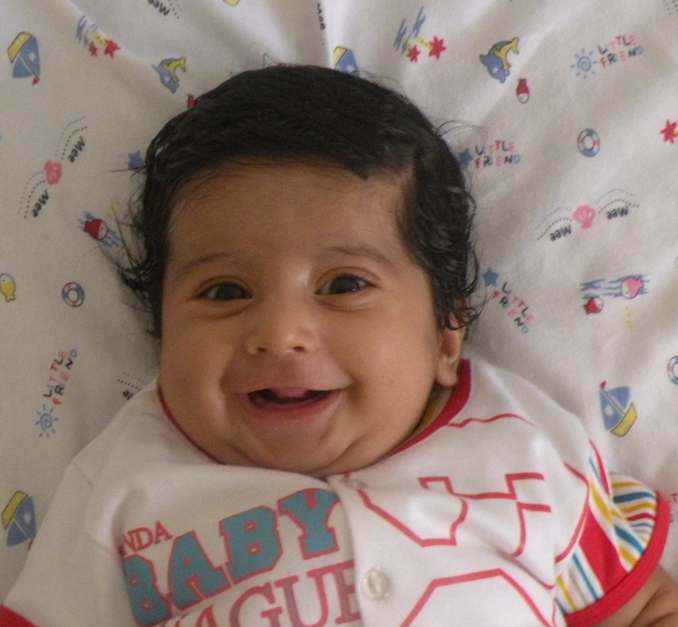 Two days ago I got mail from my friend Vikrant who has become proud father of lovely baby boy. Mail’s subject was “Whether the name ‘Vinit’ suits him?” and there was baby’s snap attached to the mail. I really loved the name and replied him “Very much…nice name!”. Cruelty or irresponsibility or both? One fine morning I was on my way to office. I stopped at signal on Ganjave chowk. There were 2 guys on a bike and pillion was holding a dog on his lap. That dog was wrapped in bed-sheet kind of cloth and only his face was visible. When I looked at the dog properly and that person tried to hide it. I had doubt that there was something fishy about it. I found that poor creature to be gesture-less and yes…it was a dead pet. I immediately felt bad for it and for its masters too. I thought they were getting it to bury somewhere near Vaikunth. Signal turned green and I was following that bike. They didn’t turn to burial area and halted on S M Joshi Bridge. I slowed down my car and waited back to see what they do. I was literally moved when they just threw dead dog into the river down the bridge. Clouds of thoughts gathered in my mind. Our pet is always close to our heart. Does this dearness limit till it is alive? Does the relation end once the animal dies? I felt it was real cruel behavior of them to throw away the dead body of the dog that was much a part of their lives till the moment it was alive. Would that dog’s soul rest in peace after seeing this? Would it repent on the fact that it lived with such people all its life? Few days ago I was suffering from viral fever and cold. I took a day off from my work called my sis (who is a doc) and noted down some medicines. I had no strength to go to medical shop myself and get those medicines and only option left was to request my Security person. I called Mr. Mishra (Security guy) and asked him to please get medicines for me. He nodded in assertion. I gave him chit with medicine names and money. After some time he returned with medicines, bill and change. I thanked him and asked him to keep the change. He left. Next day, I met him in parking and thanked again. He came up to me and asked me whether I could help him to look for any teacher’s job. He told me that he is B.A. in Sanskrit and good at language like Hindi and learned Brahmin who can do all kind of religious tasks. I was so astonished. He further told that he was interested in teaching but didn’t get any job and unfortunately works as Security man. I didn’t know what to say. Only word which appeared in my mind was ‘bad-luck!’. Last few days of Ganapati festival and crowd in Pune is at its peak. Tilak road and Bajirao road are closed and traffic is in worst condition for driving. very nice description of the places and nice photography. which lens you use for birds photography?. I read your blogs..Those are really nice..your writting style is good..
Great posts ! i agree with u about India is India ….. but it is also a fact that because u r staying abroad that is the reason u r missing India so badly… i guess u r staying alone so that adds more worse … other wise rain is rain – that place have a beauty in rain too but bit different. i know these are blogger template …. but if u mail us which one u want … will change it to word press theme ! It’s so nice to read your blog. esp with all the details you give about your travels. And also the books you have written about. I am have moved here recently and find it very informative.